Photo of the Week. 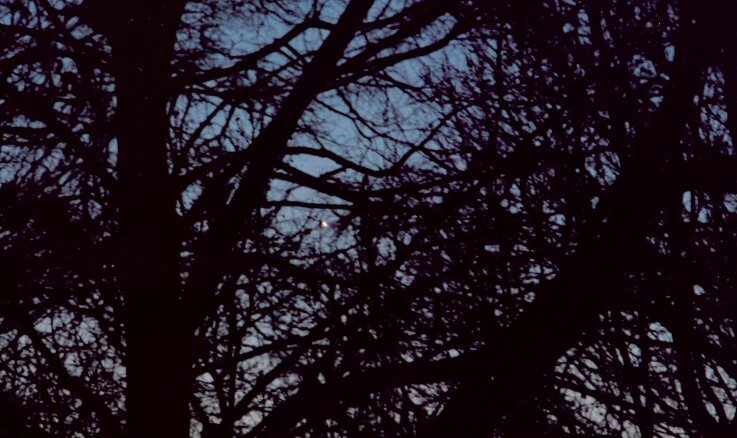 Venus shines brightly through twilight's darkened trees. Astronomy news for the week starting Friday, June 15, 2007. Skylights now resumes its weekly schedule. 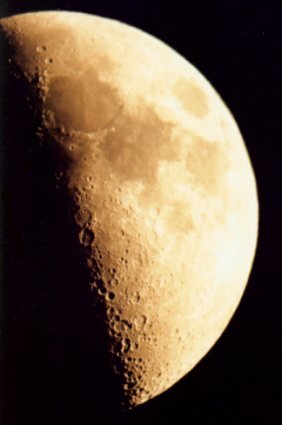 The lunar week begins one day past new, rendering the Moon quite out of sight. 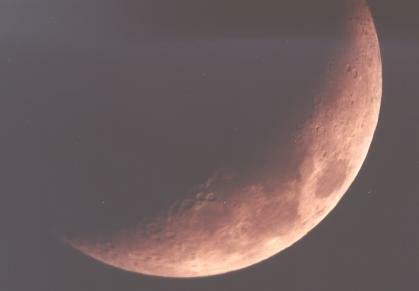 By the night of Saturday, June 16, however, you might get your first glimpse of thin crescent providing you look early enough and have a good west-northwestern horizon. Pollux -- a difficult sight -- will be just above it. On the following three evenings, the Moon plays games with Venus , Saturn, and the star Regulus. The night of Sunday the 17th, the four will line up from lower right to upper left in the order Moon-Venus-Saturn-Regulus. The following evening (Monday the 18th), the Moon will fall between the planets (Venus- Moon-Saturn-Regulus). By the following night (Tuesday the 19th), it will have skipped over both Saturn and Regulus to give us Venus- Saturn-Regulus-Moon. First quarter is not reached until Friday the 22nd. As the fattening crescent glides along, it will occult (pass over) each of the above trio. The occultations of Venus and Saturn are out of sight from North America (respectively seen in Europe and Asia), but that of Regulus is right here at home to the west of a line from Minnesota to South Carolina. Unfortunately, the event occurs on Tuesday June 19 around 7 PM Daylight Time (depending on where you are) in daylight (except in the extreme southeast), so is invisible to the naked eye and requires a telescope. By the time the sky is sufficiently dark, the crescent will have moved to the east of Regulus. While Venus is beginning to set earlier, it still does not go down until 11:30 PM, followed about half an hour later by Saturn, which is followed a few minutes later by Jupiter crossing the meridian to the south, the giant planet now already up in the southeast as the sky darkens. In the morning sky, Mars, in Pisces to the east of the Vernal Equinox, is becoming readily visible, rising easterly around 2:30 AM well in advance of dawn. It's Earth, though, that takes the prize, when the Sun passes the Summer Solstice at the Gemini-Taurus border at 1:06 PM Central Daylight Time (2:06 EDT, 12:06 MDT, 11:06 PDT) on Thursday the 21st and summer begins in the northern hemisphere, winter in the southern. At that time the Sun will be as far north as it can get (23.4 degrees north of the celestial equator), will be up (in the northern hemisphere) as long as possible, will be circumpolar (not setting) at the Arctic Circle (barring refraction, etc. ), and will not rise at the Antarctic Circle. Even though the Sun will begin to move south, it does not do so at a very great pace, and the northern-hemisphere days will continue to warm for some time. While we tend to think of Centaurus as a deep southern hemisphere constellation (thanks in part to the far-south location of famed Alpha Centauri), the figure is so large that much of it is readily visible from modest northern climes. In early evening, look for Spica to the south and a little west of Arcturus. A line dropped south of Spica passes first through Gamma Hydri then to one of the two top stars of the Centaur, Iota Cen. To the left will be Menkent (Theta Cen). If you are far enough south (below 40 degrees north latitude) you might even spot (to the south of Iota) the grandest of all globular clusters, Omega Centauri.